Cannondale’s Capo has been around for a few years now, it's always been a looker with a reputation for handling to match. This year it comes with the option of flat or drop bars. Flat bars were the order of the day when the test bike arrived at roadcc. HQ and first impressions were good due to the understated cool looks that are so important on a bike of this type. The aluminium CAAD5 frame has been around a fairish amount of time now but still looks fresh with oversized tubes and neat tidy welds especially in this ball burnished finish which is going to show any mistakes with the welding torch. Black wheels and chainset with silver finishing kit help keep the look subtle to all but most knowledgeable bike spotter. With my commute being 20 miles each way I was a bit worried about how I was going to get on living with the Capo as it designed more for the short distance city rider. Using the flattish lanes the lack of gears wasn’t an issue and once you’re up to cruising speed its easy to maintain your momentum. The position is obviously more upright than a road bike but a well thought out geometry keeps a good relationship between saddle and bar height without putting too much weight on either your arms or your undercarriage. Trackstands are easy and if you do have to put your foot down the saddle is in just the right position that you lift straight on to it as you push the pedal round its first revolution The steering is quick, very quick in fact obviously set up with flicking around congested traffic in mind, but once you’ve done a few miles you soon get used to it and its very well behaved on main roads. For the final 5 miles of my commute I hit nose to tail traffic and that's where the fun really begins, after getting the baggy shorts and courier bag out of the wardrobe I was off delivering my imaginary packages in record time. Even though the bars are a few mm wider than my usual drop bars the whole bike feels narrow and nimble and you can dive through some seriously tight gaps. The steering really comes into its own now as well with direction changes of near 90 degrees possible at high speed. Braking is taken care of by Cannondale’s own dual pivots and the power through the front was very good and easily modulated, thankfully this was the case as there are no cable eyelets to keep the rear brake cable against the top tube and after the cable ties I tried kept breaking I removed the rear brake altogether ( I know not technically legal as I was riding freewheel not fixed) as having the cable flapping about in mid air was really annoying (Editor's note: Don't try this at home… or indeed on the street). The frame itself is super stiff with no flex felt anywhere even when out of the saddle climbing up hill. 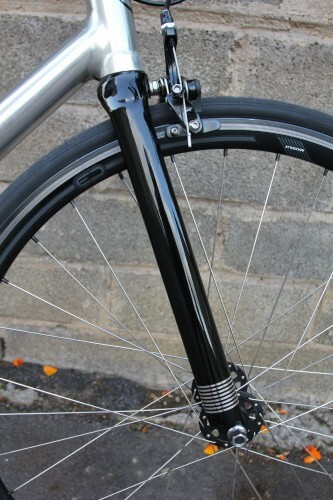 Cannondale’s own carbon track fork has just enough compliance to take the road buzz out without making the steering soft and its straight legged design helps get the Capo top marks for artistic impression. Cannondale take care of the finishing kit as well with the stem, saddle, seatpost and bars and its all good quality stuff working well and feeling solid. The saddle does provide a comfortable perch being quite stiff with just a small amount of flex. Formula track flip-flop hubs are at the heart of a solid wheelset and with smooth running bearings right from the outset should see them giving reliable service. Cannondale supply the rims which are a slightly deep section and look good in black to match the rest of the bike. The Schwalbe Lugano 23mm tyres provide good levels of grip and are pretty fast rolling, they did seem to suffer from pinch punctures though even at 100psi something other roadccers who spent time on the bike also commented on. Obviously there is very little drivetrain components on a singlespeed but what there is works well. 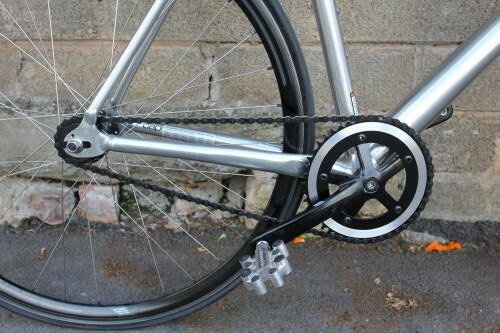 A Shimano 16T sprocket helps the chain run smoothly along with a no-name crankset. The 42T chainring ran true and gave a perfect chainline. The 70” gear is pretty usable on most terrain and easy to keep rolling on the flat at around the 17-19mph average. A basic cartridge bottom bracket finishes things off but first impressions are that its sensible kit which should stand up to all weathers. 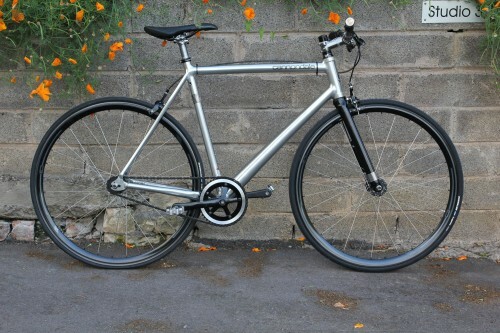 You can get other singlespeed bikes a lot cheaper than the Capo but the build quality of the frame alone is worth spending the extra on as its going to last a very long time. 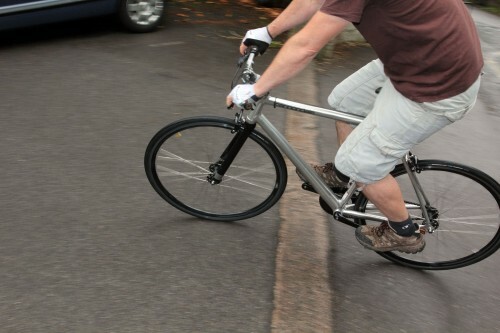 A solid all round feel makes the Capo an absolute joy to ride especially in its intended playground of the urban traffic. its understated looks give it an air of class yet doesn't scream expensive bike which should keep the bike thieves at bay. A real hit for Cannondale. Butted tubes as in the powerpyramid downtube make the frame feel the way it does. Nice Bike - Anyone know what make the pedals are? ah, but those aren't the standard pedals it comes with, our review sample didn't have any pedals on it so we stuck those on cos we thought they suited the bike, it should have a pair of track pedals with clips and straps.